My NASCAR life has been a little depressing lately because instead of talking about clever feats of engineering, we've been fixated on drug testing. Over at stockcarscience.com, I've been figuring out the difference between left-handed and right-handed forms of methamphetamine. So I'm happy to talk about something a little more straightforward, because I can look at ephedrine and pseudoephedrine molecules for hours and still not be quite sure about exactly how they differ. Ever since my post about lead sulfide particles being used to darken hair, I've been compulsively reading ingredients on my hair care products. When an ingredient in my shampoo is the same as something I saw an invoice for in the lab, I feel like I ought to check it out. In this case, the offender is SDS - sodium dodecyl sulfate, also known as sodium lauryl sulfate. SDS is a surfactant, which is a contraction of surf ace active agent. Surfactant molecules are usually long chain molecules with a hydrocarbon backbone and a head. SDS, for example, has a tail of 12 carbon atoms with a sodium and a sulfate group at the head. Surfactants are the Jimmy Carters of the chemical world: they try to make everything get along, even oil and water. The head end of most surfactants is hydrophilic, meaning that it really likes water molecules. The tail is hydrophobic, or water hating. The key to surfactants is that the two ends of the molecule have different proclivities. One likes water and one likes oil. The surfactant molecule acquires this split personality due to charge sharing. One end of the molecule has more negative charge and the other has more positive charge. (See Naveen's comment below and check out http://gold.cchem.berkeley.edu/research_twofaces.html for a really good discussion of the topic.) The hydrophilic end of the molecule likes hydrogen bonding. Hydrogen bonding is when an electronegative atom and a hydrogen that is bonded to a different electronegative atom feel an attractive force due to the interaction between the dipole moments. So when you put SDS in water, it will orient itself (when in the right concentrations) so that the tails all stick out into the water, where they can engage in transient hydrogen bonding, and the heads all stick together, making a micelle. Water and oil, of course, don't like each other. If you mix the two, they refuse to have anything to do with each other. Like a party I hosted recently, the oil-like guests go off in one corner of the family room and the water-like guests go off to the furthest corner they can find and refuse to mingle. Physicists call this phase separation. Hostesses call this a disaster. Enter the surfactant. The hydrophobic ends of the surfactant molecules are happy to hang out with the oil-like guests, while the hydrophilic ends of the surfactant are happy to hang out with the water-like guests. If enough surfactant molecules surround an oily group, they can move the oily group out into the middle of the floor. Mind you, the oil and water components are still not in direct contact - they form an emulsion - small bits of one phase in another phase. This is important in food as well as in cleaning. Vinaigrette, for example, is an emulsion of oil and vinegar. The reason you have to whisk it so hard and drizzle in the oil is because the oil and the vinegar really don't care to mingle. Mayonnaise is an oil-water emulsion, with the mediating role played by lecithin, which is provided by egg yolks. Soaps and detergents are both surfactants. The difference is that soaps are generally made using 'natural' ingredients and detergents are made from synthetic ingredients. The original recipe for soap is to mix fat and ashes from a fireplace. The alkali in the ashes combines with the oils to form soap and water. A similar process is used to create detergents, but the starting materials generally come from bottles instead of directly from plants and animals. Soaps are biodegradable; however, they combine with minerals in hard water (magnesium, calcium, etc.) and form a nasty scum that sticks in your bathtub and to your clothes. Soap doesn't wash out as well and can build up on clothing. Traditional soaps work best at high pH (alkaline) - while surfactants can be engineered to work over a range of pHs. Most of those used for skin are designed to work best at the skin's natural pH of 5.5. Regardless of whether you use soap or detergent, the surfactants play an important role. Water really likes itself. Given the chance, water will form droplets, which is the result of the molecules trying to form as compact a surface as possible. You want this to happen on your car, but not in the washing machine. Surfactants decrease the surface tension of water, allowing the water to soak into the clothing better. Although all surfactants have the same hydrophilic/phobic split personality, there are some differences between them. Anionic surfactants are those in which there is a net negative charge, like SDS, Sodium Lauroyl Lactylate and Disodium laureth sulfosuccinate. Anionic surfactants really good at removing dirt. The surfactants surround oily dirt particles that the water would normally avoid and wash right over. Because the water hating end of the surfactant latches onto the direct, the water loving end sticks out. When water rushes over it, the surfactant pulls the dirt particle away and takes it down the drain. Cationic surfactants aren't as good at cleaning. They have a net positive charge and are chemicals like olealkonium chloride, cetrimonium chloride and distearyldimonium chloride. Although they don't clean as well, they are good at sticking to clean surfaces, so they are found in conditioners, moisturizers, etc. Non-ionics (surfactants with no net charge) do a lot of different things, from cleaning to making the shampoo thicker to making the foam longer lasting. Amphoteric surfactants are the switch hitters. They are often used to make a product foamier, but they can help clean and thicken the product. These are ingredients like Cocoamidopropyl Betaine, Lauramine Oxide or Cocamidopropyl Hydroxysultaine. You might not think foam is important, but it is for two reasons. First, we've all been conditioned (sorry) to associate foam with cleaning. When companies first put out liquid laundry detergents that didn't foam, people perceived that they didn't clean as well - even though objectively, they were very good at removing dirt. Secondly, top-loading clothes washers work better when you have a lot of foam. The bubbles trap the dirt and keep it from re-depositing on your clothing. Front-loading washers don't want bubbles becuase they improve cleaning by hitting the clothing against the tub wall as it tosses it. Bubbles cushion the impact and reduce the cleaning ability. So the 'special detergent for front-loading washers' thing isn't just a way to get you spend more money. Of course, it's not that simple, otherwise the ingredient list on the shampoo bottle wouldn't take up half the surface area. Some of the ingredients are functional and others are quite literally just for looks. We like shampoos to be clear (not cloudy) and thick and smell nice. The pH is also important. Hair has overlapping scales. (The picture to the right is from http://www.vcbio.science.ru.nl/images/fesem_hair001.jpg) and shows a nice healthy piece of hair.) If the shampoo and/or conditioner is slightly acidic (ph 5.5 to 6.5, where 7 is neutral), then the scales get smoothed over and the hair lies nicely. If the pH isn't right, the scales are raised, making the hair look dull (diffuse reflection!) and feel rough. The raised scales can catch on the scales of other hair, forming tangles and snarls. We've come up with all kinds of things to remove dirt, but it would be easiest if we could just create materials that dirt won't stick to. In addition, it would be really cool if we could make a material that also wouldn't get wet. In otherwords, our ideal material would repel water and oil. You may have seen materials that repel water, but that's the easy part of this trick. Water has a very high surface tension, so it likes balling up. Oils, on the other hand, have very low surface tension (often 4-5 times less than water), so they like to soak into surfaces like fabrics. Leave it to Robert Cohen's group at MIT to create something that is omniphobic - it repels water and oil. Their surface is an array of toadstood-like structures with stems are make fr om silicon and the 10-micron-wide, third-of-a-micro tall caps from silicon dioxide. 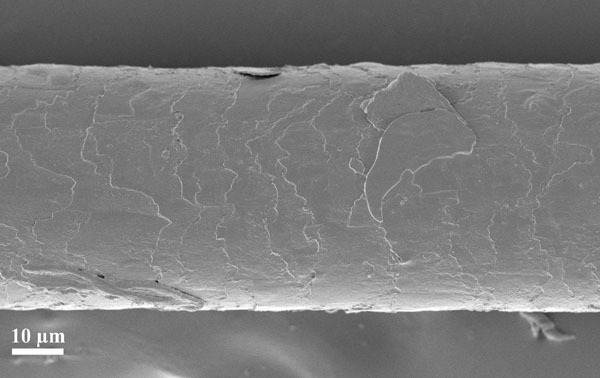 10 microns is the size of the line in the picture of the hair above. The structures are called microhoodoos, as they resemble small hoodoos, a geological feature that results from erosion. Oil and water both 'bead up' when confronted with this surface. The structures balance the forces of gravity (which want droplets to lie flat) with surface tension, allowing oils and high-surface-tension waters like liquids to ball up. As soon as they figure out how to make a kitchen apron from this stuff, I'll be the first one to buy it. I love your blog, particularly how you tie interesting science into everyday experience. I just have a slight correction to your statement that "the surfactant molecule acquires this split personality due to charge sharing. One end of the molecule has more negative charge and the other has more positive charge." Actually, the hydrophobic end is usually neutral, and is "attracted" to oil in the same way oil is "attracted" to itself, mainly because of mutual repulsion with water. There's still no good molecular theory for the hydrophobic effect, and is also dependent on the relative length scales of the hydrophobic surface (here's a nice intro from David Chandler's group: http://gold.cchem.berkeley.edu/research_twofaces.html).